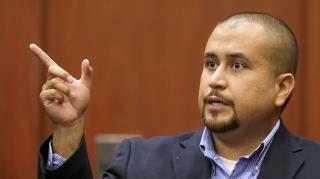 (Newser) – It looks like George Zimmerman has sold his gun after all. Both TMZ and WKMG report an online auction that ended Wednesday received a verified top bid of $120,000 for the weapon used to kill Trayvon Martin. A higher bid of nearly $140,000 by "John Smith" appeared to be bogus. In fact, WKMG reports that auction site United Gun Group actually had two auctions going—a fake one open to the public destined to attract pranksters like "John Smith," and a closed one made up of pre-qualified bidders. "I would like to thank and give the glory to God for a successful auction that has raised funds for several worthy causes," Zimmerman said in a statement addressed to "Fellow Patriots." The Trayvon Martin Foundation declined to comment. ALL guns and ammo must be BANNED, NOW! The family now has something to go after. This is any weirder than People buying John Wayne Gacy's paintings while he was in jail?